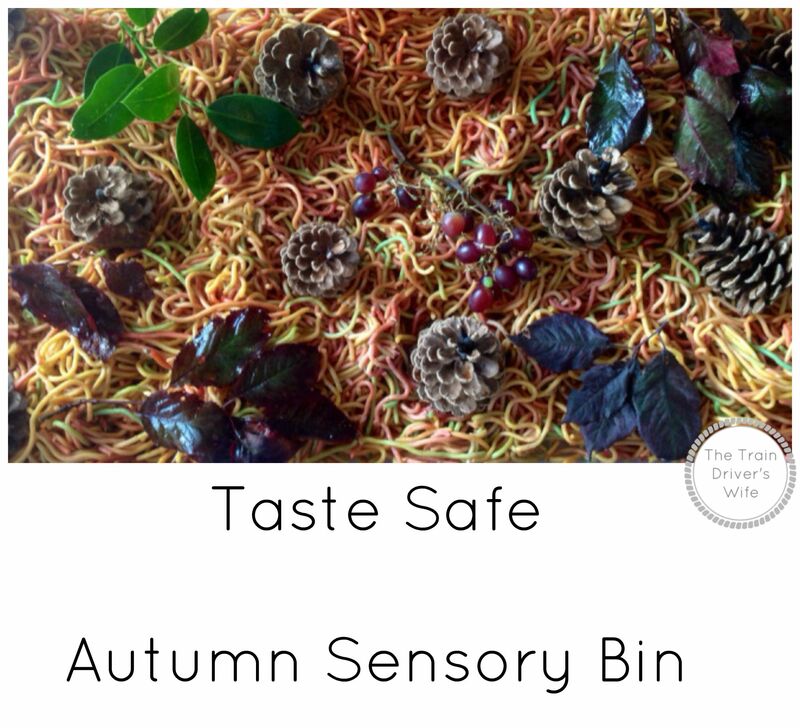 I’m totally embracing the changing seasons this year and I have been itching to try new sensory plays with Buddy that incorporate the Autumn theme. 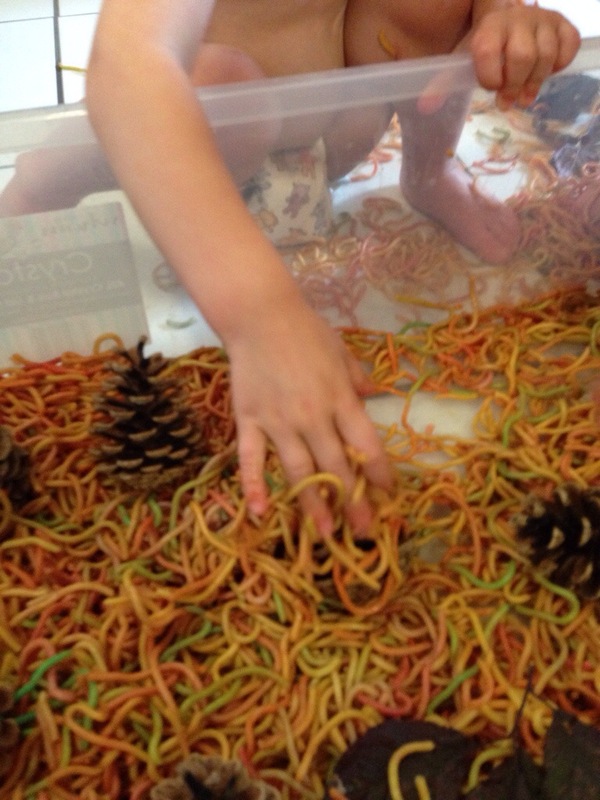 Fortunately we had some spaghetti left over from our Rainbow Spaghetti Play that looked like the perfect base for an Autumnal Sensory Discovery Bin. We used our left over mixed up spaghetti as a base for this play. You can read how to colour your spaghetti on our rainbow spaghetti play post. Obviously, if you’re just going to mix it all up to make autumnal colours you don’t necessarily have to use all of the colours of the rainbow! Buddy’s friend Monkey came to play today which meant twice the mess and twice the fun! Monkey is 20 months old and it was really interesting to see how differently he and Buddy (12 months old) approached the sensory bin. Of course, Buddy went straight in with both hands and started munching instantly (I swear I feed him real food too!) Monkey preferred to observe and poke the spaghetti and pine cones with one finger for a while. Buddy was clearly not impressed with Monkey’s observations, so he spent a while throwing spaghetti at him. Fortunately Monkey wasn’t too bothered by this and he enjoyed playing with the spaghetti on the floor. Monkey and Buddy then both decided to rummage in the bin. Buddy had spied the grapes (surprise surprise) and he munched on those for a while. 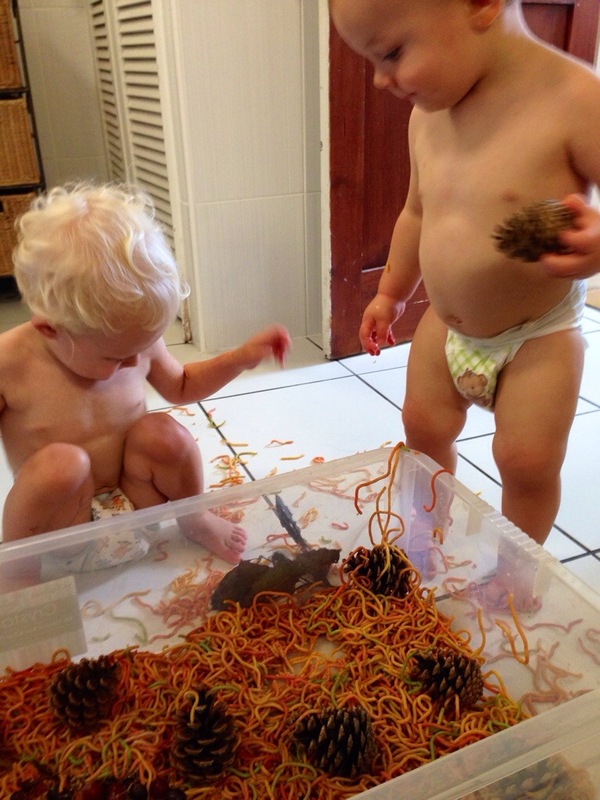 Monkey was playing with the pine cones in the spaghetti. He carefully draped spaghetti over the cones until they were buried. We talked about the colours that we could see and we pretended that the pine cones were trees. Monkey’s mummy then decided that the spaghetti was wiggly worms, which Monkey found hilarious! Monkey spent a good amount of time investigating the pine cones. Unfortunately I was a bit distracted at this point as Buddy was attempting to climb up the airing cupboard after getting bored with the spaghetti. This was a really fun play which looked amazing and the kids really enjoyed. It works on lots of skills and could open up lots of ideas and themes for older kids too. If you enjoyed this taste safe activity, why not also check out our 30 Taste Safe Sensory Plays or our 30 Taste Safe Doughs. looks like great fun! Will have to give it a go with my youngest when the older ones are back at school/preschool! found you on the bloghop. Hi Robyn thanks for dropping by! I hope you enjoy having a go 🙂 please pop back and let me know how it went! Ha, I see why you mentioned him eating everything in the other post about the ball pit. He looks like he was really enjoying the spaghetti. Haha, yes Buddy is a total muncher. I’m hoping he will grow out of it one day (soon!) He really enjoyed this play although i can’t believe how much he ate! It was really interesting to me to see how differently Monkey played at just 8 months older. I can’t wait to watch Buddy develop in that way. Lovely seasonal sensory play and it’s always good to try with a friend too. Looks like he enjoyed it. Hi. I am a Nanny of an 8-month old girl, and I am Always looking for fun, educational, cheap and mess-free ideas to do with kids!! Thank you so much!